Here we see a classic example of "tolerance" from the left. What they "tolerate" are people that think in lock-step with all the dictats of "The Party" (TP-D). 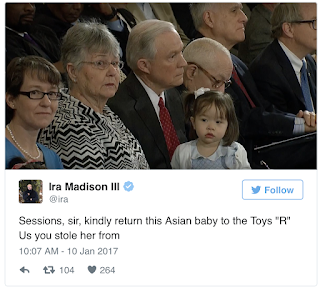 Others deserve to be maligned in any way the left desires, including calling their granddaughter a "prop". The whole article is worth the read, it covers the attacks on Bobby Jindal well. In TP doctrine, "Thou shalt not be a Republican if you are not lily white saith TP! Such is an abomination before TP and requires that you be put to at least political death as painfully as possible by any means possible". For far too many standard-bearers of their movement, disagreement with any conservative on policy need not be tempered by basic civility, since the Left is always entitled to be mad about whatever it is they’re mad about, and thus, the ends always justify the means.